What do Frankenstein (originally published in 1818, and frequentlyand freelyadapted ever since) and Jurassic Park (1996) have in common? In both, scientists defied social norms in order to create new life from old forms employing the latest biological techniques. And in both, we watched the terrifying consequences unfold when their biological innovations went “bad.” The dark and dangerous aspects of manipulating nature with biology are classic themes in horror. Why, I have wondered, is biology so prevalent in these dark and foreboding tales? One explanation for the prevalence of biology in horror is the use of biology to create monsters, and its usefulness as a tool to speak about the tragedy of monstrosity. Although you can create a monster through mutation using the physical sciences (as with radiation), to create an original monster of flesh and blood requires biology. Some of the best monster films ever made are steeped in biology. For example, in Creature from the Black Lagoon, youve got lead biological characters (an ichthyologist, a marine biologist, the creature), biological plot devices (evolution, speciation, mutation), biological sets (marine settings and marine parks), and numerous scientific “moments” in which biological concepts and tools are explained and utilized (evolution charts and the use of rotenone). Creature from the Black Lagoon isnt the only example. Even stories that are presumably about radiation and atomic science are often resting upon a biological foundation, as in the giant ants in Them! Biology, it seems, makes for wonderful horrors. As we enter into what has been called the “biological revolution,” stories about the risks of biological science are becoming increasing popular. As people have marveled at the prescience of Jules Verne or Aldous Huxley and the social and mechanical innovations they described, so too are we captivated by H.G. Wells cautionary tales of unchecked scientific endeavor (Island of Dr. Moreau) and Michael Crichtons critiques of biological containment (Andromeda Strain, Jurassic Park, Outbreak). BioHorror films are mirrors that reflect real value conflicts in society about the use of the technology. For example, BioHorror films may highlight issues of power and ownership in society that can set in motion a destructive use of the technology. BioHorror films may also signal that extra levels of precaution should be taken in using the technology by emphasizing risk, safety and justice concerns that have been made public. For example, by showcasing potential “failures” of fail-safe mechanisms, the BioHorror film may predict a biological catastrophe in the making. Our growing awareness that the application of biology can harm us as well as heal us has been mirrored in speculative film depicting the potentially horrifying consequences of biological science. Perhaps more importantly, these works reflect societys concern about how researchers and doctors are occasionally blinded by the passion of discovery, so much so that they overstep the bounds of morality and humanity, becoming the mad scientists of many of our favorite movies. Many classic monster films find a comfortable fit in the BioHorror genre. One of my favorite examples is a film adaptation of H.G. Wells Island of Dr. Moreau, Island of Lost Souls (1932). Island of Lost Souls portrays a mad biological research scientist (Moreau, played by Charles Laughton), and his assistant, Montgomery, a downtrodden, drug addicted clinical doctor who, we later discover, has lost his license to practice medicine. We are introduced to Moreau and Montgomery through the adventures of the castaway Parker (Pendrick in the novel) as he uncovers the truth about the hideous experiments that are occurring on Dr. Moreaus island. Dr. Moreau, like many mad scientists, tends to think of himself as a unappreciated hero of the human race. He is an accomplished physiologist, well-versed in transfusion, the studies of “morbid growths,” and vivisection. Forced to flee London, Moreau continues his research, using surgery, transplantation, socio-behavioral training and the manipulation of “germplasm” (which would later become known as genetics) in order to “evolve” the subjects of his experiments. 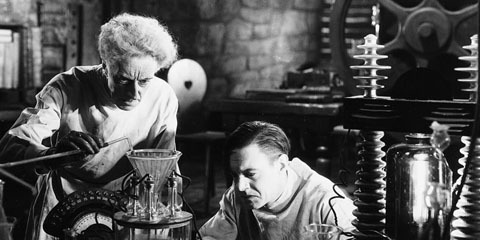 His controversial experiments involve the transformation of animals into human beings through a rapid, expansive, and artificially-triggered evolutionary development, resulting in a menagerie of partially-successful although obviously flawed and tormented subjects (one of whomthe Sayer of the Lawwas artfully portrayed by none other than Bela Lugosi). Although his creatures have learned to say of Moreau, “His is the hand that makes. His is the hand that heals,” it is evident that Dr. Moreau is the quintessential mad scientist. He is blinded to the pain he causes by his passion for discovery and the heady power of manipulating nature free from the restraints of societal pressure. The setting, like the characters, plays a critical role in establishing the mood, as well as the circumstances in which Moreau pursues his scientific endeavors. As with many other mad scientists, Dr. Moreau is exiled from conventional society because he insists upon doing unethical research. Like many horror movie villains, Dr. Moreau actually prefers the isolation the island provides, allowing for fewer distractions from the work that so fully absorbs his attention. Although remote, the island provides many of the sources necessary to conduct his research. What the island doesnt provide, he is able to purchase and have delivered by men more interested in money than morality. Dr. Moreaus island is a spectacular example of the settings characteristic of BioHorror. The laboratory, aptly called the House of Pain, is tucked within the tropical foliage of the remote island, a hideaway within a hideaway. Locked fences, doors and windows complete the sense of imprisonment and isolation of this setting. Animals imprisoned within the complex are often heard in the midst of a painful, reconstructive howl, creating a truly horrifying and disconcerting atmosphere. The props of Dr. Moreaus surgical evolutionary laboratory add detail to an already frightening set. These include: the most advanced instruments of surgery, surgical gowns, cages, a tamers whip, restraints, operating tables, and a menagerie of wild animals in cages. Quite noticeably, however, no anesthetic is present. Dr. Moreau is not content with his apparent success at rapidly evolving nature with biology; he wants as well to “evolve” society with his biological creations. We learn this through Parker, the lead character who reveals, and then condemns, Dr. Moreaus experiments. The plot of the film is a heroic one, in which Parker overcomes the seductive and brute forces of nature that Dr. Moreau places in his path. For example, Dr. Moreaus plan to mate the Panther Woman with Parker fails when he rises above his natural instinct to “mate” with her. In this moment, Parker wins his internal conflict between biological sexual instincts and the “higher-order” virtues of a human morality. His virtue vindicated, Parker is now empowered to face up to the clever but immoral Dr. Moreau, and defend himself against the powerful but morally unsophisticated Beast People. This simple tale tells a complex story about socio-biology. Parkers human nature, his biological self, threatens to undermine his standing as a moral person. But Parker prevails, and Moreaus experiments turn against him as they revertdevolveto their natural state. This story reflects some of the earliest public anxieties concerning the advent of biological ideas. The idea of evolution, first proposed by Darwin in the 1850s, caused an uproar precisely because it suggested that people are closely related toand slightly evolved from“lower” life forms. Some people suggested that evolution could go in reverse; leading to proposals that some types of people were actually animals because they “devolved” or were “under-evolved.” Eighty years after Darwin published Origin of Species (1859), some people were advocating that society reorganize itself using biological ideas in order to secure a superior moral standing of people over animalsand over each other. Island of Lost Souls was produced during the hey-day of eugenics in the United States, a movement that advocated social hierarchy based in part on the principles of animal breeding. In the U.S., the privately funded Eugenics Survey of Vermont (1925-1936) used biological concepts of genetics to “develop ‘pedigrees of degeneracy among Vermonts rural poor”1 that were, in turn, used to support policy changes such as enforced sterilization. Island of Lost Souls (1932) also spoke to a revitalization of the anti-vivisection movement that was occurring in England at the time. England was home to the first social movements to reduce cruelty in surgery and experimentation to both people and animals beginning in the early 1800s.2 In 1876, Darwin and Thomas H. Huxley (grandfather of Aldous Huxley who authored Brave New World in 1932) together authored legislation to minimize cruelty in animal experimentation. Wells book, published in 1896, captured the heated public debates about the horrors of surgery and experimentation of the time. Although anesthetic had been discovered in 1870, it was not uncommon for animal experimentation to proceed without its use. Darwin himself had dropped out of medical school in the early 1800s because of the terror he experienced in witnessing the amputation of a childs leg without anesthetic. In 1932, there was still no consensus on if or how animal experimentation should be regulated to minimize cruelty. The convergence of eugenics and anti-vivisection debates in the early 20th century marked the perfect time to bring back Dr. Moreauat least on film. By showing the terrifying consequences of biological endeavors gone awry, Island of Lost Souls is part of a larger cautionary tale about biology that has been told in film again and again. BioHorror films such as this one challenge our historical use of biology as a tool to manipulate life in order to “progress” as a species. For a contemporary version of this theme, we turn to a film that is often overlooked because the monstrosity of the tale is woven delicately through it like a thread. In this case, the thread is a strand of DNA, and the film is aptly titled using the four letters that represent amino acid building blocks of the genetic code (T, A, G and C). In GATTACA (1997), we are introduced to some of the elements of the BioHorror genre in the present. Beginning with the title, GATTACA, and present throughout the film are the symbols and signs of what has been frequently called our current revolution in biology. In GATTACA, we are introduced to a revolution against the societies created in the new biological age. The plot concerns a young mans struggle to overcome his destiny, which is determined by his genetic probability to be healthy, intelligent and gifted. The young man, Vincent Freeman, struggles to live up to his name in a society that has been re-ordered through socio-biological innovation. As with many lead characters who are victims in the horror genre, Vincent is a social outcast, a freak in the genetically-enhanced society, naturally born without the “benefits” of genetic counseling or genetic intervention. In this “genoist” societya society where your genetic code determines your social classa new kind of “compassionate conservative” eugenics has become not only normal, but institutionalized. Vincents high likelihood of developing heart failure in early adulthood condemns him to the lowest class of work. He and others like him are called “degenerates”, which is pronounced “de-GENE-erates,” a play on words using the original term recycled from the eugenics movements of the past. In order to pursue his dream of becoming an astronaut, he “disappears” from his home, his family and society, and buys a new genetic identity on the black market. Jerome Eugene Morrow, genetically perfect but paralyzed from the waist down as a result of an accident, sells Vincent his genetic identity in exchange for financial support. With hair, skin flakes, and urine farmed from Jerome, Vincent fights to achieve his dreams in this biologically deterministic society with nothing but the sheer force of his free will and a great deal of money, pain and personal sacrifice. The film GATTACA is breathtakingly thorough in its use of biology. Through elegant microscale photography, we enter the world of sloughed skin, fallen hairs, and cell filled traces of fingerprints that are the imprints of who we are, the traces of where we have been. Through a speculative plot focusing on a society that embraces biological determinism as a major organizing principle, GATTACA brings us to consider how biological advances can enslave us as much as they offer us cures. In GATTACA they have realized one kind of eugenic society first promoted at the turn of the 20th century, but have found that this biological future is a dystopia for many that must live in it. The story of GATTACA incorporates advances in biology since the time of Island of Lost Souls. The eugenics movement of the 20s and 30s in America was greatly challenged after the cruel and horrifying use of eugenic ideas by the Nazi political leadership as justification for categorizing, experimenting on and killing millions of people in Germany, 1933-1945.3 GATTACA considers how biological methods discovered since that time may be providing an impetus for some scientists to pursue once again this vision of a “biologically enhanced” society. Key discoveries that have been made since 1932 include: the identification of chromosomes; development of statistics that predict the units of heredity within a population of organisms; the discovery of DNA and the gene; and the ability to decode, move, and create new genes in living organisms. The resurgent interest in the so-called “new eugenics” was evident in 1997, the same year that GATTACA was released in the theater. Princeton geneticist Lee M. Silver, for example, detailed some of the virtues of a new eugenics in his book, Remaking Eden: Cloning and Beyond in a Brave New World. Many more scientists have followed suit, with some suggesting that within decades, entire societies will be determined by genetic technologies. BioHorror stories such as GATTACA and Island of Lost Souls help us to reevaluate such claims. Films in the BioHorror genre in particular suggest that we reconsider the idea that biology is inherently beneficial by showing us where the science could go without the oversight of an attentive public. Classic films such as Island of Lost Souls offer us a glimpse into the history of public debate about biological ideas and abuse of biological technologies that have taken place for almost two centuries. As the “biological revolution” evolves, we can foresee possible risks and consequences of transforming our essential biological naturefrom giant tarantulas and gill men, to Vincent Freeman and genetic determinism. By following the thread of biological innovations and controversies through time, we can better appreciate the roles played by contemporary films such as GATTACA. With biological technologies that have greatly increased our power to manipulate bodies biologically, I dont doubt that there will be a plethora of films that continue to address the threat of unchecked biological science in contemporary film. Each discovery in biology brings a round of new, troubling conundrums that society, not science, has to grapple with. These films provide some reassurance that public concerns about the potential applications of biological technologies are not completely unfounded. Indeed, the prescience of some classic BioHorror stories regarding the potential harm of biological technologies validates the need to proceed with caution and deliberation in their use. Emily E. Pullins invites you to join her in watching a new genre unfold by participating in further discussion about the BioHorror genre at her BioHorror website. The author would also like to acknowledge the generous and substantial editorial contributions made to this piece by Pam Keesey.